Oh Darling, You Are Fabulous! I went to Starbucks in Kapolei a few days before my trip to Alaska. I found these really beautiful Hawaii Starbucks cards. I often bring gifts for friends I will meet when I travel. For this trip, I decided to pick up a few of these cute Hawaii Starbucks cards to give as gifts. The card design was navy blue with red and yellow hibiscus flowers on the front. The word "Hawaii" is iridescent and really shiny! Next, I needed to package these cute gift cards!!! I had an idea!!! I decided to make a punch art Hula Girl card. I played around with my framelits and punches and before you know it, this fabulous Hula Girl was born! The face takes up the entire front of a standard size card. I used our Layering Oval Framelits to create the shape of the face and the body. I used a whole oval for the face and half an oval for the body and adhered them to a Basic Black Card Stock background as shown below. I layered a strip of Pineapple Punch card stock across the bottom of the card. 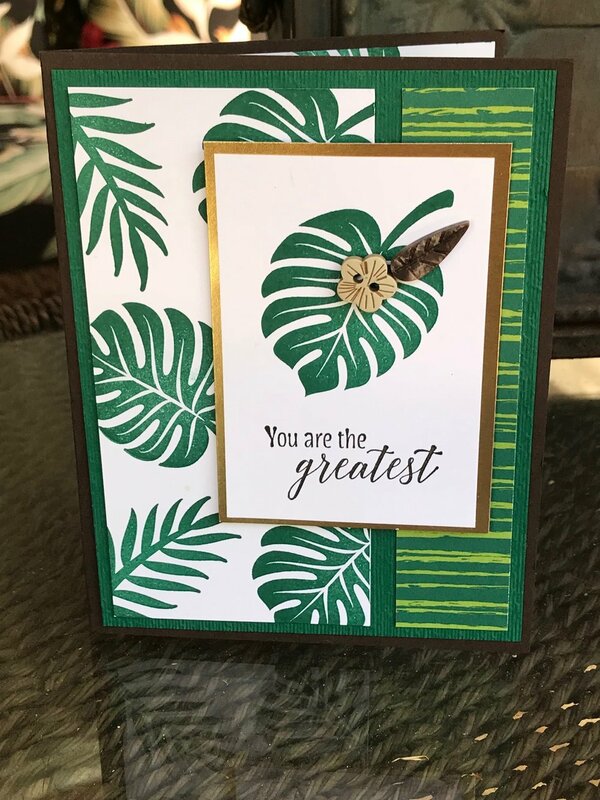 I rounded the corners with a corner rounder and stamped it with flowers and leaves from the Tropical Chic stamp set. I used a 1 3/4 inch circle punch to take a small piece out of the top to create a scooped collar. After stamping the flowers, I added some tiny Red Rhinestones to them. I then layered a piece of Basic Black card stock with rounded corners over the top oval to create bangs. You can follow the photos below to watch the progression. 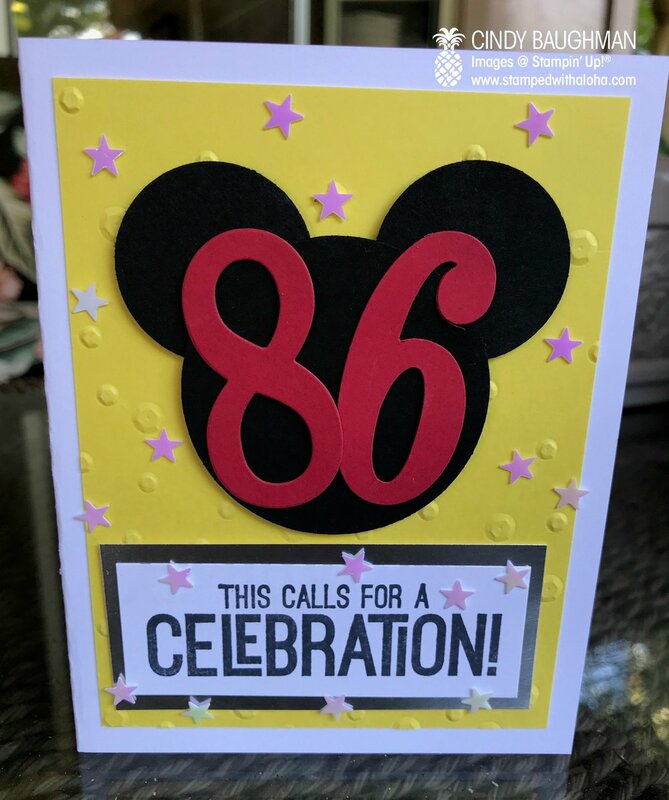 Demonstrator Mary Fish designed this awesome new Vases Builder punch that coordinates with the stamp set Varied Vases that she designed when she reached her million dollar sales mark with Stampin' Up! If you like punch art, this punch is a must have as it produces many fun pieces to work with. I used several of the pieces from this punch to make the face. I punched pieces from the Vases Builder Punch to create the smile, nose and I cut one of the vases in half to make the ears. You can see the face elements in the photo above and below you can see how I tucked the split vase on each side of the oval to make ears. I adorned the head with a Haku Lei that I created using the Tropical Chic stamp set and coordinating Tropical Thinlits. I added dimensionals to the back of the stamped and die cut pieces to create a flower crown as shown in the photo above. Once all assembled it looked like this. The lei around the neck was made with the circles that are found in our Cookie Cutter Builder punch. I punched the small circles out of Glossy White card stock and lined them up to resemble a Pikake lei. Here is a close up, don't you think she's fabulous? You know who else is fabulous? 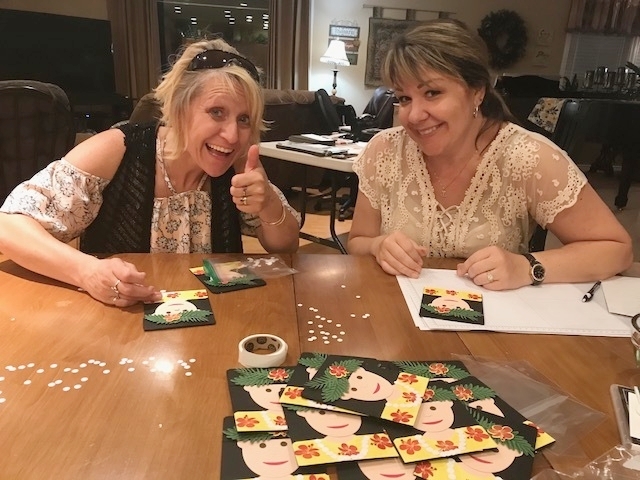 My sister in laws, Lisa and Jen who stayed up till the wee hours of the morning helping me assemble these cards when I was in Washington State, visiting family. My friend Debbie was there too but I think she was too busy counting circles to jump in the photo! Debbie and I did manage to take a photo together the next day when we went hiking together at Snoqualmie Falls before she headed back to Oregon. Can you believe that she drove all the way from Oregon just to stamp with me!! Now that is a fabulous friend! Debbie really liked this card because she loves Hawaii where she once lived when she served in the US Coast Guard. 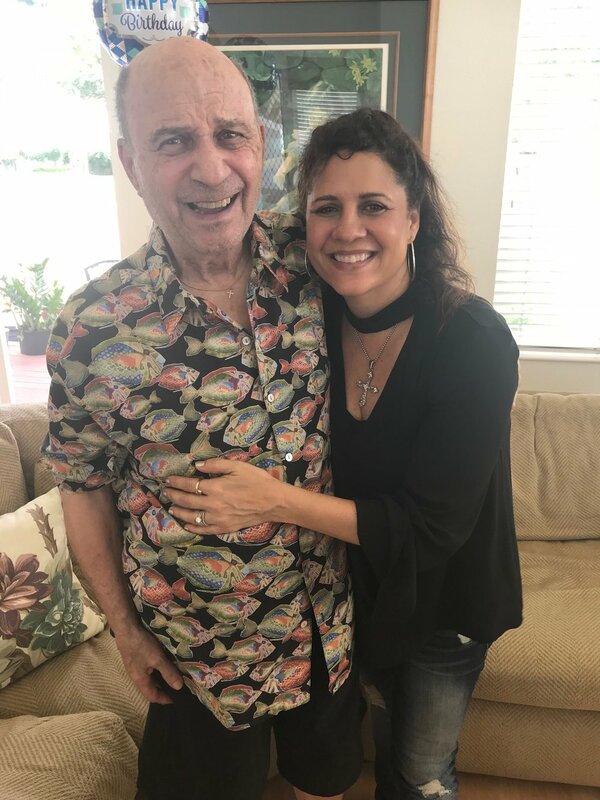 I hope Debbie will one day make Hawaii her home again! I have never done a punch art type of card in such a large scale before. Where I not only used punches but Framelits too! 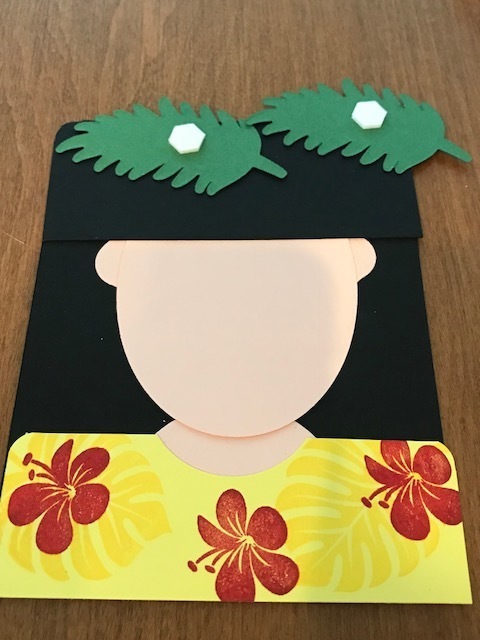 I really enjoyed creating this Hula Girl card and it was fun to see the smiles created when I passed it out to some of my demonstrator friends. The inside of this card was stamped with the sentiment, "Oh Darling, You Are Fabulous". This sentiment comes from the stamp set Stitched All Around. I think that is an important message to share with friends now a days as people need to reminded of truly how remarkable they are! It feels great to be encouraged and reminded of how loved you are. I hope my fabulous friends who received this card know that is how I feel about them and I hope they think this card is fabulous too!